1036, CENTER CAP USED, 75-80, FORD, MERCURY, COMET, GRANADA, MAVERICK, MONARCH, POLISHED, DOMED, NO LOGO, BOLT ON, 2" TALL X 2-5/8" DIA. 1081, HUBCAP USED, 14", 78-80, BUICK, CENTURY, REGAL, HONEYCOMB TYPE, POLISHED OUTER RING, SILVER PAINTED HONEYCOMB WITH BLACK BACKGROUND, RAISED POLISHED CENTER, BLACK BACKGROUND CHROME HAWK LOGO, 6 METAL CLIPS. 1201, Chevrolet Citation Center Cap OEM Used, '81-'85, POLISHED, RAISED RED CENTER, RAISED CHROME BOW TIE, PUSH ON TYPE, BACK 6-1/4" & FRONT 6-7/8"
128, Hubcaps used, 14", 72-75, AMC, HORNET, POLISHED, WITH BLACK RING, RAISED CONE CENTER, 6 TEAR DROPS WITH GRAY TEXTURED OVAL AND A BLACK CIRCLE, NO LOGO, METAL CLIPS. 1423b-1, CENTER CAP USED, 15" 85-93 FORD, MUSTANG, THUNDERBIRD. POLISHED WITH BLACK FORD LOGO ENGRAVED IN CENTER. FLAT PUSH ON 7" DIA. 1489, CENTER CAP USED, 15", 86-90, OLDS, TORONADO, CUSTOM, Cruiser, POLISHED CHROME, WITH BLACK CENTER AND CHROME LOGO. 2 CLIPS 2-1/4" DIA. 1489, CENTER CAP USED, 15", 86-90, OLDS, TORONADO, CUSTOM, Cruiser, POLISHED CHROME, WITH BLACK CENTER AND CHROME LOGO. 2 CLIPS 2-1/4" DIA. SOME '86 HAVE ACCENT STRIPE. 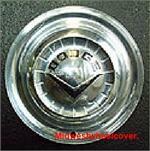 1490, CENTER CAP USED, 86-91 BUICK, LESABRE, RIVIERA, POLISHED, DARK GRAY LOGO, PLASTIC CLIPS, 2-1/2" DIA. 1631, CENTER CAP USED, 88-92, OLDS, CUTLASS, SILHOUETTE, SUPREME, POLISHED, BLACK & SILVER EMBLEM, PLASTIC CLIPS, 2-1/4" DIA. 1695, USED RIM, 15X7, 5 LUG, 5-1/2", 89-93, DODGE, 100,150 PICKUP, VAN, RAM CHARGER, POLISHED WITH 8 ROUND HOLES, ALLOY. 1949-50-BUICK, Hubcap, 15", 49-50, BUICK, POLISHED CAP, ETCHED WORD BUICK IN BLACK, METAL CLIPS. 1951-52, PLYMOUTH, Hubcap used, 15", 51-52, PLYMOUTH, PASS, POLISHED FINISH, DOMED CENTER, RIBBED BACKGROUND, SAILING SHIP LOGO, METAL CLIPS. 1951-PONT, Hubcap, 15", 51, PONTIAC, PASSENGER, POLISHED METAL CAP, RINGED CENTER WITH RED BACKGROUND AND INDIAN HEAD LOGO, METAL CLIPS. 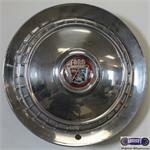 1954, PLYMOUTH, HUBCAP USED, 15", 54, PLYMOUTH, POLISHED CAP, 12 RIBS, RED AND BLUE PAINTED CREST, METAL CLIPS. WITH FADED LOGO. 1954b-DODGE, Hubcap used,15", 54, DODGE, POLISHED CAP, 18 NOTCHES IN CENTER, BLACK PAINTED WORD DODGE, BLACK PAINTED V, METAL CLIPS A=RED B=BLACK. 1954-FORD, USED Hubcap, 15", 54, FORD, POLISHED CAP, RED AND BLUE LOGO, 32 RIB TYPE. METAL CLIPS. 1955-56b-1-FORD, Hubcap used, 15", '55-'56, FORD, POLISHED METAL CAP, 32 RIBS, RAISED PLASTIC CENTER, COLORED EMBLEM, METAL CLIPS. 1955-56-DESOTO, Hubcap used, 15", 56, DESOTO, POLISHED CAP, 3 RINGS, SUNKEN CENTER WITH "DES" LOGO, METAL CLIPS. 1956-OLDS, Hubcap, 15", 56, OLDSMOBILE, POLISHED OUTER, SILVER PAINTED RINGS, RAISED CENTER WITH WORD OLDSMOBILE, METAL CLIPS. 1957a-FORD, Hubcap used, 14", 57, FORD, FAIRLANE, T-BIRD, PASSENGER, POLISHED CAP, 24 WHITE PAINTED RIBS, RAISED CENTER, WHITE PAINTED BACKGROUND, POLISHED WORDS FORD, CONE CENTER, METAL CLIPS. 2023a-1, Hubcap used, 15", 74-78, CADILLAC, ELDORADO, POLISHED, CHROME OUTER RING FIN TYPE, RAISED CREST AND LEAF IN CENTER, 4 SETS OF METAL CLIPS.